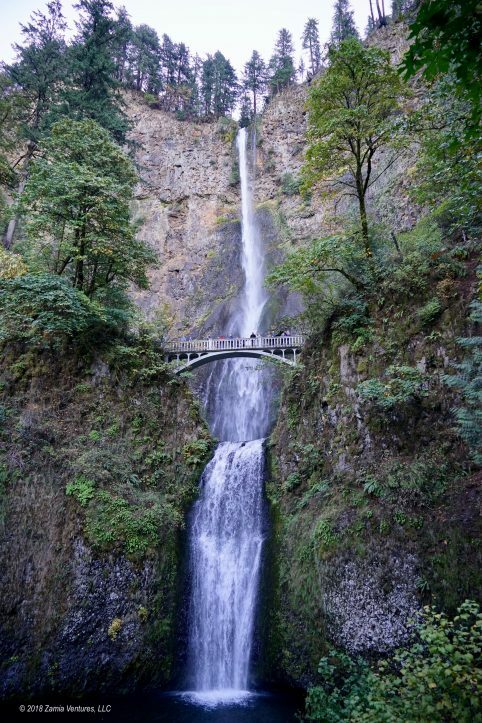 The Columbia River Gorge: It’s Gorge-ous! We emerged unsettled but unscathed from our visit to the remote areas of Eastern Oregon, and after crossing the Cascades we discovered a wonderland of green. After months of seeing dry, sagebrush-filled landscapes, the leafy moisture of the Columbia River Gorge is almost hard to fathom. I’ve definitely been unreasonably excited to see moss on trees. Between the increased humidity and more oxygen-rich air at lower elevation, we are both sleeping better and healing from stubborn little skin abrasions that just wouldn’t go away for months. I guess those athletes who sleep in hyperbaric chambers to assist in recovery are not completely goofy after all. Even our trailer is happy about the change in environments — several cabinet hinges that had been making increasingly annoying squeaking noises seem to have been miraculously cured by the humidity. 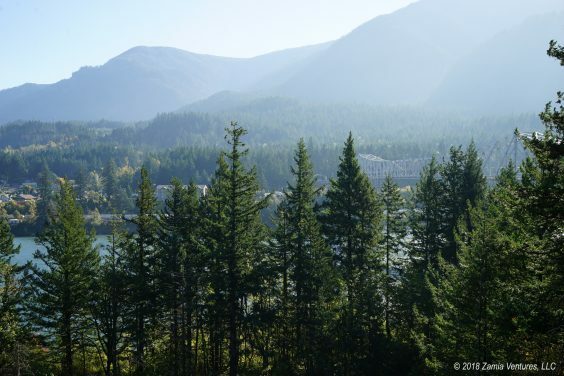 We have nothing but good things to say about the weather in the Columbia River Gorge. A reliable local source tells me that Portland is subjected to cold, rainy weather approximately 10.5 months per year, but our experience was totally different. Extrapolating from our 1-week sample size, Portland and the Columbia River Gorge area have nothing but spectacularly sunny days with highs in the upper 60s. (Your mileage may vary.) The fantastic weather set the stage for us to explore the area from our extremely leafy campsite in Ainsworth State Park. 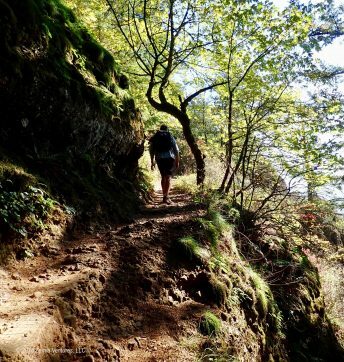 I mean, it was so leafy — and we were so close to the cliffs that make up the Oregon side of the Columbia River Gorge — that at camp we lived in a perpetual twilight of shade, despite the persistent sunny weather. The moss was charming, but the darkness made it hard to get out of the house in a timely manner in the mornings. Once we finally made it out of the campground, we were greeted with spectacular scenery everywhere. Just driving on the highways around the Columbia River Gorge area was a feast for the eyes. The massive Columbia River is lined with majestic trees and rugged rock outcroppings. Dramatic waterfalls descend from the sides of the Gorge. The human-made edifices like historic bridges and the Bonneville Project are impressive in their scale. 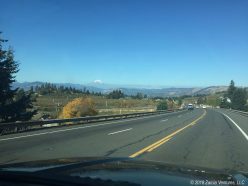 We were constantly delighted to round a bend in the road and see lovely vistas crowned by views of Mount Hood or Mount Adams in the background. Apple picking was in full swing at the apple orchards south of Hood River. The intense sunlight we enjoyed throughout our visit made the fall colors on the trees seem almost fluorescent. The whole area seemed like a magical Instagram post generator. View from Interstate 84 is not too shabby! For Floridians, we have a surprising number of friends and family in and around Portland. I suppose any number greater than zero would be a surprise, but we were delighted to have multiple chances to meet up with family and friends in the area. We spent a Saturday evening in the brewery-rich industrial area of Portland catching up with a law school friend and his wife, while tasting the excellent beers at Base Camp Brewing. Add in some great food from the food trucks that are permanently parked at the taproom (the ultimate Portland dining experience, I am told) plus tons of tips on local destinations, and it made for a perfect evening. During our stay we also visited with my aunt who lives in the charming town of Hood River, east of Portland, where we devoured some truly outstanding pizza at Solstice Cafe while enjoying quality family time. She seconded the recommendation of our friends to check out Pfriem Family Brewers, which we did on a subsequent day after hiking in the area. After so many months of interacting with complete strangers on the road, it was really nice to relax with friends and family. Given our interest in industrial engineering, we were not going to miss the massive Bonneville Project on the Columbia River, especially since it was only 5 miles from our campsite. 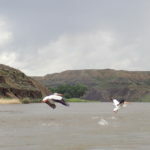 It turned out to be much more than just another dam tour! Fish ecology was actually the highlight of the site. Like the Fort Peck Project on the mighty Missouri, Bonneville was a massive Depression-era construction project that stretched the limits of engineering science of the time. Unlike Fort Peck, Bonneville’s initial two hydroelectric power generators were very quickly joined by eight more, as wartime manufacturing needs and the growth of the Pacific Northwest population rapidly led to increased demand for electricity in the area. In another contrast to Fort Peck, Bonneville features a navigational lock. A significant justification for the project was to improve Columbia River navigation by flooding the areas with the worst, most treacherous rapids, which means that the windy and choppy river we see today is a much tamer version of what our pals Lewis & Clark faced on their journey through the area. The free tour offered by the Army Corps of Engineers was comprehensive and fascinating. Best of all, we were able to trot out all our favorite dam-related jokes that have been in storage since our stay at the Hungry Horse Dam near Kalispell. Recycling: it works for humor also. Well, maybe. The fish ecology aspect of the Bonneville Project was new to us, and quite interesting. The Columbia River has long been known as a key route for upstream travel of spawning salmon and other fish, and the return of fingerlings to the sea, so fish migration was taken into account in the initial design of the dam. The fish ladder gives fish a safe route to travel upstream through river water (not through the locks or the electricity generation facilities) to reach the smaller streams where they will reproduce. As an added bonus, the fish ladder was constructed with massive glass walls along one side to allow observation of the migrating species. Since becoming operational, the Bonneville Dam has always been staffed during daylight hours by “fish counters” who attempt to record every fish that swims up the ladder, classified by species and size. To be clear, the fish counters are people — technology does not yet have the skill to properly count and classify all the fish. I was initially drawn to the idea of having a job as a fish counter… looking at an aquarium-like environment all day seems relaxing! But on further reflection, I think the task of picking out and recording each of the frantic fish headed upstream to die would be more like Lucy in the candy factory. The other major fish-related function at the dam is the adjacent Bonneville Fish Hatchery, where millions of salmon eggs are harvested, artificially fertilized, and incubated each year, with little ones raised in pools until they are ready to be released into the Columbia to head out to sea. Both the dam and the fish hatchery did an excellent job explaining the life cycles of different types of salmon and other species that migrate along the river. One of the big attractions at the hatchery is the sturgeon viewing area, where underwater windows make it easy to see giant (10+ foot long) fishes from a lineage that is hundreds of millions of years old. The supremely wonderful weather was perfect for exploring the natural areas around the Gorge. 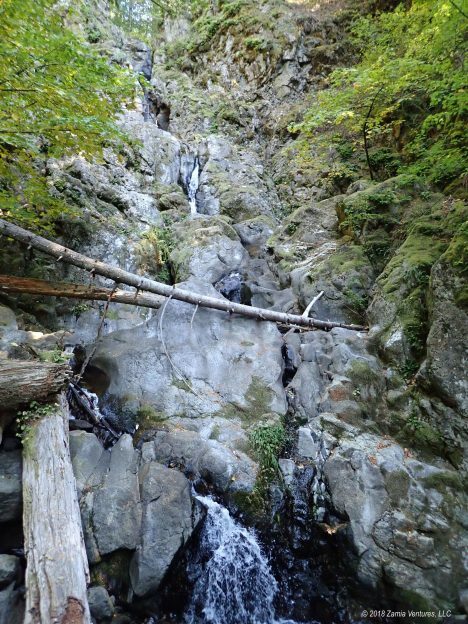 We did two significant hikes while we were in the area: one on Mount Hood, and the other in the Gorge. Our Mount Hood hike started from the historic Timberline Lodge, which is the center of a very busy downhill ski area in the winter. 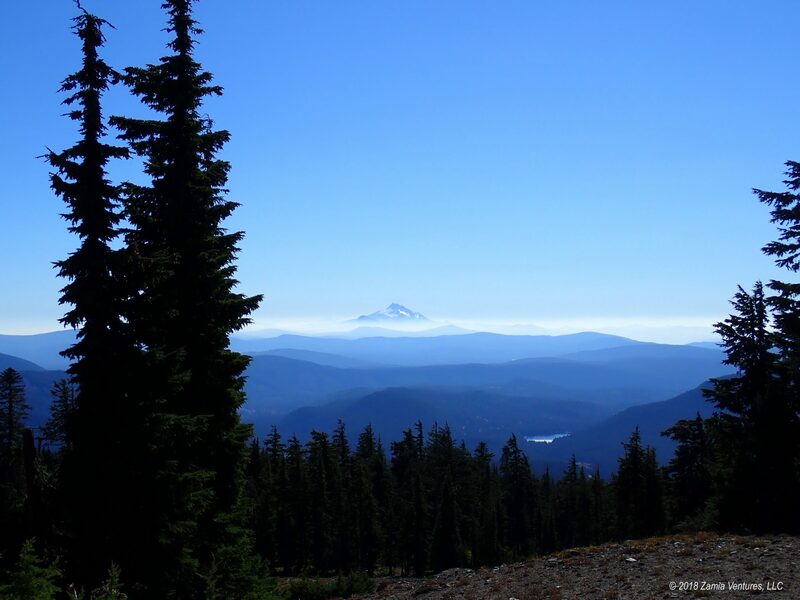 We hiked out and back along a section of the Pacific Crest Trail that travels across Mount Hood. Thanks to the utterly clear skies, we were able to enjoy great views looking south across the Cascades, punctuated by Mount Jefferson and the Three Sisters. Our other main hike was in the Gorge, and, as one might expect, it basically involved hiking up the side of the Gorge. Most of the trails on the Oregon side of the Gorge are closed as a result of the 2017 Eagle Creek Fire, so we headed over to Washington for our Gorge hiking. 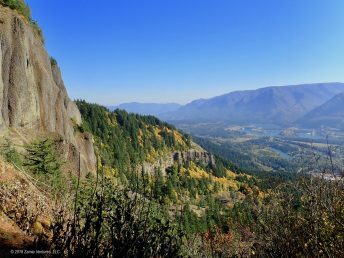 With 2,000 feet of elevation gain over just 3 miles, the Hamilton Mountain Trail was pretty grueling, but our efforts were rewarded with outstanding views of the Columbia River and the surrounding mountains as we made our way up the steep trail. 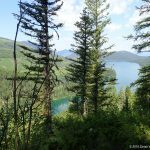 We loved the mixture of dense forests, lovely waterfalls, and open vistas on the trail, although the endless switchbacks did become a little onerous. The trail was precarious at times. We also encountered a small mishap with the Airstream. Unlike our last damage issue, which we successfully repaired ourselves, this one was entirely of our own making and we elected to engage professional assistance for repairs. When we initially parked the trailer in our spot in Ainsworth State Park, we apparently did not fully appreciate the slope of the campsite, even after getting leveled up on our blocks. After we were parked, with our stabilizer jacks fully deployed, we discovered that we were not as securely parked as we believed. We discovered this when we were both sitting in the trailer as it rolled off the blocks. We each immediately did the first thing that occurred to us: I shrieked “We’re moving! AAAAAAAGGGGGHHHHH!” while Ken leapt outside and attempted to brace the trailer with his bare hands, Superman-style. Fortunately we only rolled about two feet, but it was enough to severely bend the stabilizer feet on one side of the trailer. 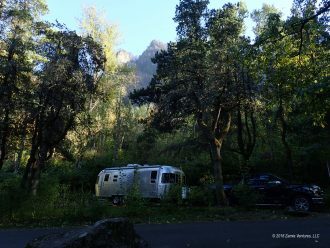 Luckily for us, Portland is home to the largest Airstream dealer on the west coast, and we were able to quickly make an appointment for repairs. We went in prepared to have four new stabilizers installed, and were thrilled that the dealer was able to straighten out our existing jacks to make them functional again. Apparently all it took was a little percussive maintenance. We were nearly ready to try banging the feet back into shape ourselves, but since we were so close to a large dealership we were happy to let the experts handle it. We might be more apt to try a DIY solution now that we have more experience with the issue. In any event, we are now very paranoid about super-tightening all our chocks, and I’m sure we won’t make this particular mistake again. Live and learn. Next up: After 8 months on the road, we will finally see the Pacific. 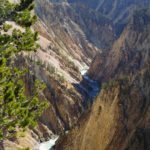 Fabulous photographs and most interesting report about this gorgeous area. What an adventure you are privileged to live! All the new things you learned and experienced! I did not know they are raising sturgeon in Oregon, I always thought the fish ladders are all about the salmon. I also found all the fish information surprising. The fish ladders are for about 4 different kinds of salmon, shad, lampreys, and some more species I am forgetting. The sturgeons at the hatchery are mostly for viewing but they live in the Columbia and the sturgeons on display were caught in the river nearby. They are very weird-looking fish. Beautiful pictures of the Columbia River area. I remember Portland being very green but I didn’t get a chance to visit the surroundings area. At the time I visited the weather was very humid, cool and not particularly sunny. Looks like you enjoyed gorgeous weather. Believe it or not there is a sturgeon breeding “farm” in Florida. Mote Aquarium in Sarasota has an east location that contains large vats used to breed sturgeon. They sell the locally grown caviar to help support the aquarium. I was surprised at how large the sturgeon grow. They are some of the strangest looking creatures on earth. 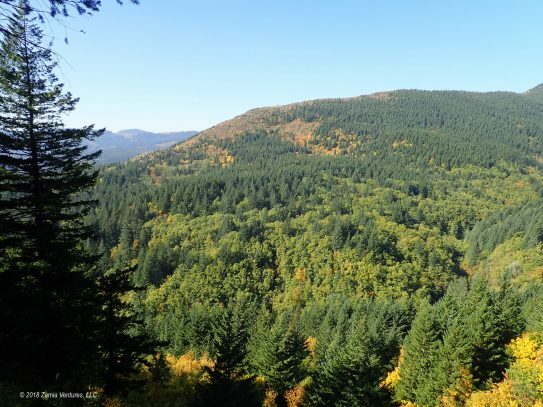 We were incredibly lucky with our weather in the Portland area, and the good weather allowed us to appreciate the scenic beauty of the area. I understand that sturgeons live in all sorts of environments throughout the northern hemisphere, including the Gulf of Mexico! Since they generally stay close to the bottom they are not so easy to detect, however. We’ve seen sturgeon farming operations in several different locations, and they never fail to impress us.